The Katsura Imperial Villa (also known as Katsura Detached Palace) is one of the finest examples of non-religious Edo-era architecture in Kyōto. 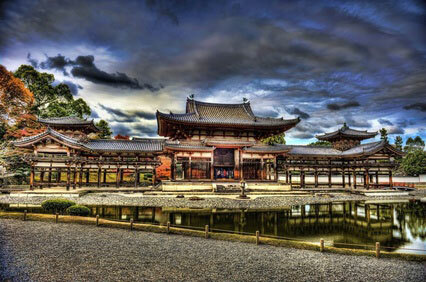 The palace, old and middle shoin (drawing rooms), tea houses and moon-viewing pavilion are organised around a large pond in perfect harmony and simplicity. 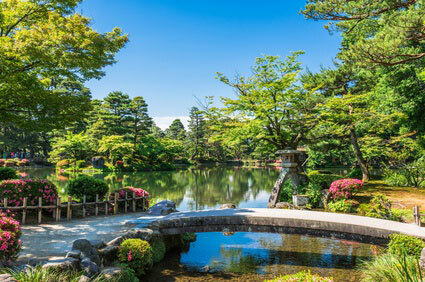 The garden, laid by Kobori Enshū, is Japan's first stroll garden, and a masterpiece of Japanese gardening. 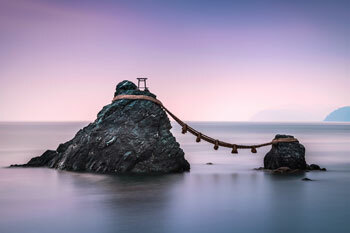 Unlike other Japanese gardens of the time, which were intended to be seen from inside a building or on a boat, this strolling garden was meant to be enjoyed on foot. 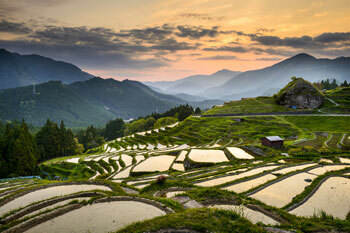 It should be noted that Enshū managed the feat of creating splendid, articulate scenery out of a bleak, flat marshland. 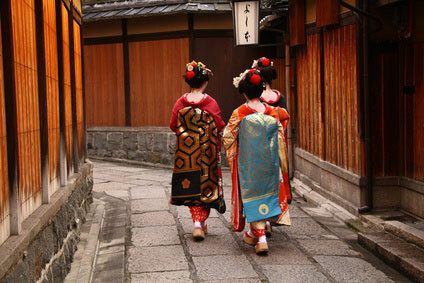 The Katsura district of Kyōto has been a favourite place of the court for moon viewing since the Heian Era. This imperial villa was built between 1620 and 1624 by Prince Hachijō Toshihito (八条智仁 ; 1579-1629), brother of Emperor Go-Yozei and adopted son of Toyotomi Hideyoshi. 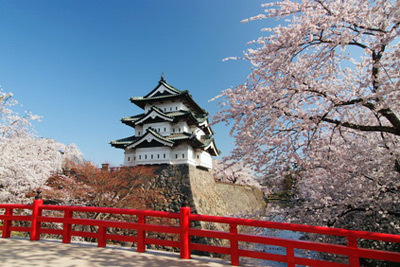 It was expanded by his son, Toshitada, three decades later. The villa was originally named Hachijō-no-miya (八条宮 ; Hachijō's Palace). Over time the name evolved to Tokiwai-no-miya (常磐井宮), Kyōgoku-no-miya (京極宮), and finally Katsura-no-miya (桂宮), before the line died out in 1881. Katsura Rikyū has had a noted influence on Western modernist architects in the 20th century. 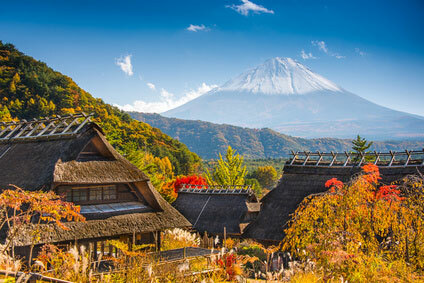 The first was the German Jewish architect Bruno Taut (1880-1938), who published three books on Japanese culture and architecture, praising the simplicity of historical Japanese architecture such as the Katsura Imperial Villa. His work had a major impact on Le Corbusier and especially Walter Gropius, who visited Katsura in 1953. In the late 1950's and 60's, Australian architects like Philip Cox, Peter Muller and Neville Gruzman also became inspired by the villa. 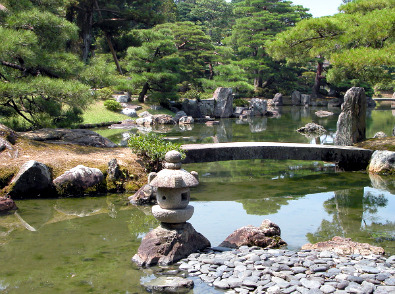 Katsura Rikyū can only be visited by guided tours. Appointments are required and should be made a few days in advance at the Imperial Household Agency (see Kyoto Imperial Palace). Participants should be at least 18 years old and have their passport or alien registration card with them. Tours are free and can be arranged from Monday to Friday, and the third Saturday of the every month (every Saturday in April, May, October and November). They last one hour and normally start from 10:00 am and 2:00 pm. Tours are in Japanese only but English audio guides are available. The villa is closed on national holidays. 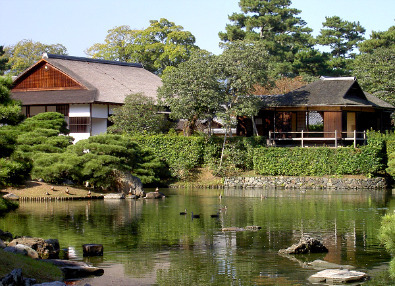 The villa is located on the banks of the Katsura-gawa River, just above Hachijō-dōri Avenue. 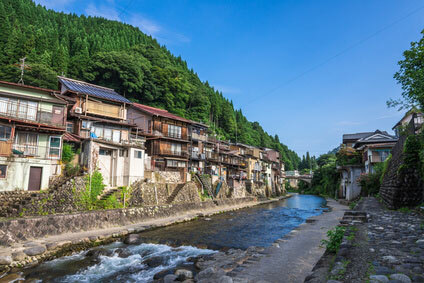 It is 600 metres (10-15 minutes walk) north-east from Katsura Station on the Hankyū Kyōto line. the journey takes a mere 6-7 minutes from Karasuma or Kawaramachi Station (￥180) in the city centre. If you are coming directly from Kyōto Station, take bus No 33 until Katsura-rikyu-mae, just after the bridge.